I must admit that the reason I continued to refuse The Winner’s Trilogy a second glance was because of its overly gorgeous covers. Covers with pretty girls in even prettier dresses have seldom ended up as my favorite or even decent reads (with the exception of Kerstin Gier’s Girl About Time Trilogy, but time travel is always the exception to the rule). Fresh off The Orphan Queen, I was looking for another nice fantasy to delve into and the Winner’s Curse and/or its sequel kept being thrown in front of me by Goodreads and Amazon. But what really sealed the deal was running into it at a local discount book sale. I took it as fate and reluctantly opened the first page and did not stop until I had finished The Winner’s Crime. And so, never judge a book by its cover, remains good law. The Winner’s Curse introduces us to world of Valorians and Herranis, amongst others, where the former, a proud warrior class of people, have conquered the artistic and god-fearing Herranis, just because they could. To survive, the Herranis surrendered, only to be enslaved by the Valorians. Kestrel is the 16-year old daughter of a Valorian general, who has been given a choice to marry or join the military, like all young adults her age. However, she is a lousy combatant and wants no part in Valorians’ thirst for war, much to the dismay of her father who believes she is a brilliant strategist and will prove beneficial to their war efforts. She also does not want to get married. Rather, she wants to be free of her society’s encumbrances and be a pianist, a quality frowned upon by the Valorians. She soon meets Arin, a Herrani slave put up for auction, who she impulsively purchases for a high (and scandalous) price. She sees a kindred spirit in Arin and eventually finds herself struggling to hide her feelings for him. But Arin is hiding something as well, something that will not only change the landscape of his relationship with Kestrel but also the very landscape of the world they live in. She is a refreshing YA lead, if there ever was one. It was nice to read about a heroine that is dreadful at fighting and a warrior princess is the last thing she wants to be. That being said, she is by no means a naive socialite only concerned with dresses and dinner parties. She is a brilliant thinker and strategist and harbors a deep love of music. She questions her society’s stubborn pride and narrow mindedness with the same hard determination that underpins her people. And while she has a compassionate side, Rutkoski balances it realistically with her dispassionate upbringing. All in all, she is incredibly well imagined, her qualities set her apart from the crowd but also seem like logical digressions for someone from that particular environment, thus not making her devoid of clichés. The start of Kestrel and Arin’s relationship almost gave me a sinking feeling about the future of the series. They fall in love, quick and hard, despite being two very different people from opposing sides of a terrible war. However, the first book takes a dramatic turn at half-time, transforming their seemingly benign relationship into this wonderfully complex thing. They have a good understanding of what a Valorian means to a Herrani and vice versa but unlike their brethren the understanding is not a blind one. The alternating POV, albeit in third person, facilitated this quite well. The Winners Trilogy, for the lack of a better comparison, is Downton-Abbey-meets-Game-of-Thrones. The historical setting with ball gowns, tea/dinner parties, honor duels and societal manners makes it for a fun read. The fantasy is confined to Rutkoski’s brilliantly imagined empire with the Valorians at the forefront with their mad obsession to violently conquer it piece by piece and cull any insurgence swiftly. The political dynamics of the empire and its shrewd underpinnings are flushed out more so in the second book, transforming the trilogy into not only a breathtaking romance but also a no holds barred political thriller. It reminded me very much of Panem’s somber situation and the tyranny of President Snow. Admittedly, bad is a particularly harsh take on Arin. He is a relatively good character with just a few traits that did not agree with me. I found Arin to be very sentimental, recklessly so and often just plain reckless. Given the significance of his agenda, I expected him to be a lot more subtle. I was surprised that with the way he went about things that he was not caught out at the outset. That being said, it was still not enough to resist liking him. Like Kestrel he has this unwavering commitment to his cause which he balances quite well against his feelings for Kestrel. Kestrel, arguably correctly, does not share this sentiment and feels Arin has a blind spot for her to the point of recklessly endangering his life if not their nations’ life. An illusion of self importance, you say? Maybe, but Arin gives her little reason to think otherwise. The Winner’s Crime, the second installment, carries on like a tragedy of errors for the most part. I expected the misconceptions, mostly on Arin’s part, to last well into the novel but not until the very end. That made matters a little repetitive and frustrating. That being said, it also served as a brilliant setting to delve into the angst and tension between Arin and Kestrel, something Rutkoski penned very well. After a teasing pace, Rutkoski ends the novel with a gut-punching cliff hanger, leaving me with not only a killer good-book-hangover but also a torturous wait for the final book in the trilogy, The Winner’s Kiss, which is expected in early 2016. 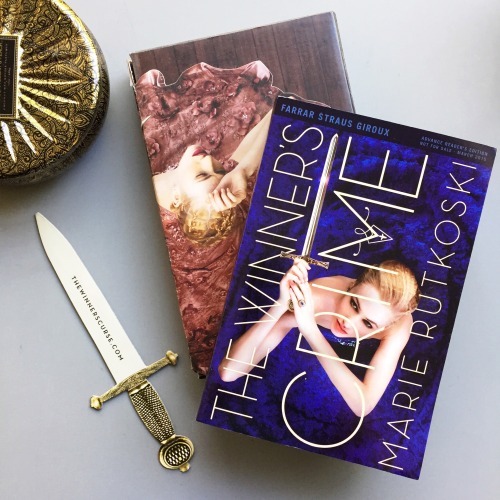 In conclusion, the first two installments of The Winner’s Trilogy were a delectable read, a clever combination of heart-wrenching romance and heart-stopping political intrigue. Rutkoski’s overall focus on brains over brawn particularly resonated with me because while I love my divergents and mockingjays, the protagonist who brings down a draconian empire via mere words also needs to be aptly represented. So, if you enjoy historical dramas, political thrillers and/or forbidden romances, give The Winner’s Trilogy a go. You will not be disappointed.